5 entries categorized "Divine Design"
(Edited to add piercing template below) . . . Philippians 4:13 -- My Divine Design project this month. 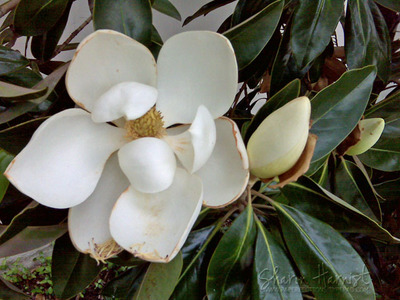 If you've missed the others over the past several months, you can click on "Divine Design" at the bottom of this post or in the Category list over in my right sidebar. 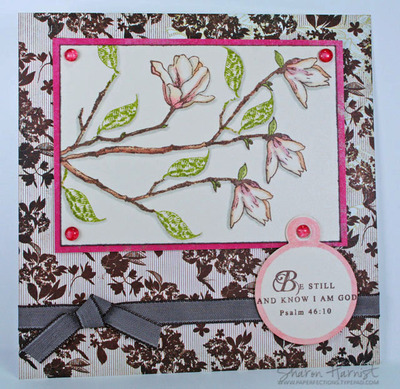 You can read all about this challenge over on SplitcoastStampers.com here -- anyone is welcome to play along. In last month's post, I showed you my intent for these pages -- to make matching 6-inch scrapbook pages of my daughters and give the full album to my Mom at the end of the year . . . I think she'll like that! This scripture is from the set I've been primarily using for this challenge, Papertrey Ink's Everyday Blessings. It is stamped with Adirondack Pitch Black onto these yummy Bohemia papers by My Mind's Eye that my friend, Eli, sent me -- I'm not certain if the pattern is still available. The flourish around the verse is Karen Lockhart's Vine Millinery Embellishment, stamped in Adirondack Cloudy Blue, then clear Copic Spica glitter pen outlines it. The verse was cut with Spellbinders Nestabilities Classic Circles and matted with Classic Scalloped Circle dies. I pierced holes around the outer edge of the circle. The background square is 5.25" with 1-inch half circles adhered to the back, creating the scalloped edge and making the overall size 6". Another Millinery Embellishment was stamped on coordinating green paper and placed in the upper left corner. The holes of the design were pierced and this piece was also outlined with clear glitter pen. That yummy fuzzy dot ribbon is by May Arts that my sweet friend, Cindy, sent me from her StarLitStudio store ... it's available in all different colors! Just lay it over the paper you want pierced and select which row fits your project best. Because the holes in the canvas are larger than your piercing tool (or you can just use a thumb tack/push pin), choose a spot within the hole to stay consistent from one to the next. For instance, the lower left corner of the hole. You can usually find these canvases in just about any crafting store (or probably WalMart), in the yarn/knitting/needlepoint/cross-stitch kit aisle. The one I used here is 3" across and came in a package of 10 for $1.17 at Hobby Lobby. They are available in different shapes and sizes. You can even purchase large sheets of it and cut it to whatever shape you need! Or Gina K Designs is offering a Piercing Template-3 pack of a circle, star & square for $1.49. I fell a little behind this month on my Divine Design challenge usually posted on the 8th of each month (< you can click on that link to read about my past ones). So when my friend, Asela Hopkins, asked if she could send me her new stamp set to play with, I knew this set would be perfect for my next challenge and I waited just a bit longer to share this with you all, until the set would be released for sale this Thursday, July 24th through Gina K Designs. If you don't happen to know Gina K, she started her stamp company with a vision of helping others in need and wonderful causes that help them out. You can read all about her past campaigns here. I've been fortunate enough to design for this sweet lady in the past and finally got to meet this spunky little spitfire in person this past weekend at CHA. Let me tell you -- she is one funny lady and an absolute sweetheart! You can follow the release of Asela's special stamp set over at Gina's blog. 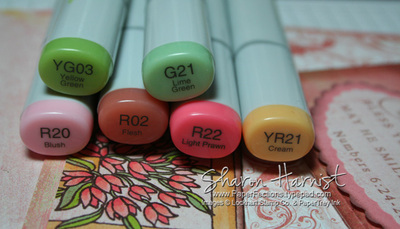 Be sure to find the post where she's giving away one of these stamp sets for free! Back to Asela -- she created this stamp set for her friend, Daisy, who is battling cancer -- you can read Asela's heartwarming story about her friend here. $4.00 of every retail set sold will go to the American Cancer Society until the end of August through a donation of part of the proceeds from both Asela Hopkins and Gina K. Designs. The yellow horizontal strip was stamped with Adirondack Butterscotch dye ink with Cornish Heritage Farm's Pretty Pattern backgrounder on a pale yellow cardstock. The edging around the horizontal strip was cut using yet another Spellbinders new CHA-released die, the Victorian Pierceabilities (S4-167)! A little machine stitching and darling yellow flower sparkle gems finish off this page. It has pretty much the same elements. On the background, I used the flower center die (which is a separate piece) to only emboss a few spots -- I liked the added texture this provided to the plain cardstock background. 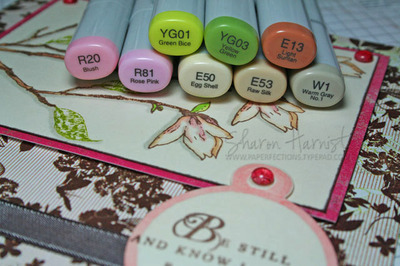 The Labels Two die (S4-161) was used to cute the photo and some Papertrey Ink Lemon Tart Satin Ribbon finishes it off. Be sure to check Gina's blog over the next few days. She's showing some wonderful sneak peeks of new sets, Asela's included, that will be available for sale on Thursday at Gina K Designs, along with links to quite a few more blogs with wonderful inspiration with these sets. Also on Thursday, Gina will post the entire set for you to see. I'll be back later this week with some new Spellbinders projects to share with you, and some more CHA reports! It's the 8th again and time for a Divine Design. As a reminder, or if you haven't visited here before, you can read all about the project here. This is a 6"x6" page that will go in a brag book album along with photo pages of my daughters for my Mom the end of the year (don't worry, it will be a surprise since Mom has no computer!). I'll only get a tiny bit sappy this month about this project . . . I've been thinking about and missing my Dad lately. Maybe it's because he loved his Texas Rangers baseball games and never missed them! Today is opening day for the Rangers' new season -- maybe that's why he's been on my mind. Dad passed away two weeks before my youngest daughter was born, almost 6 years ago. I thought about him when I read this verse: "May the Lord bless you and keep you. May He smile upon you." Numbers 6:24-25. Yes, indeed, I know He is, Dad. I knew I wanted to use Karen Lockhart's Tulips on this project in some way and decided to do a border. 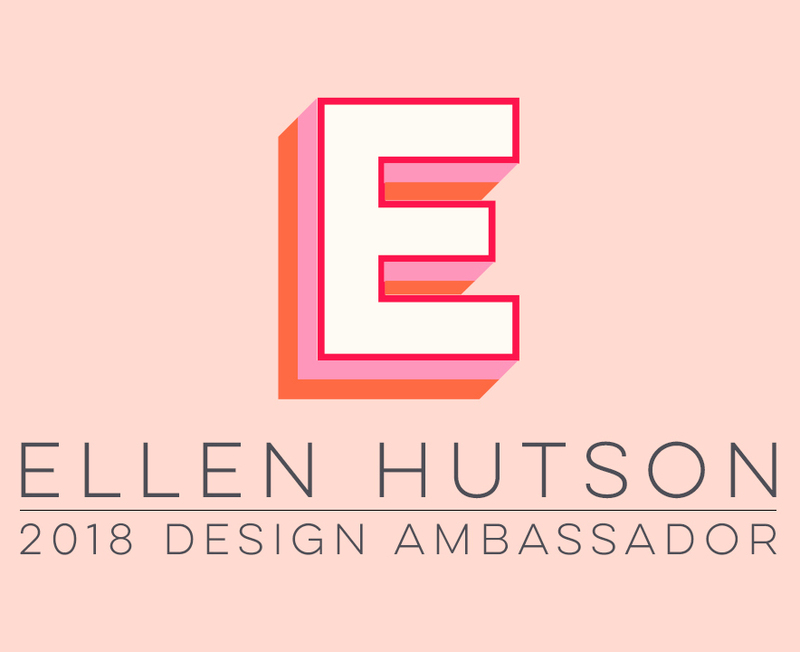 This is Ellen Hutson's Stamp of the Month, so check out the great deal she has for you! The verse is from Papertrey Ink's Everyday Blessings. It was stamped on more of the light pink paper and then cut with Spellbinders Nestabilities Petite Scalloped Oval. But before cutting, I inked the inside of the die (that goes next to the paper) with a rose chalk ink from ColorBox's Rose Petals Queue. Then when you cut & emboss, the ink transfers to the paper, giving you an instant border . . . how cool is that, it looks double-matted! 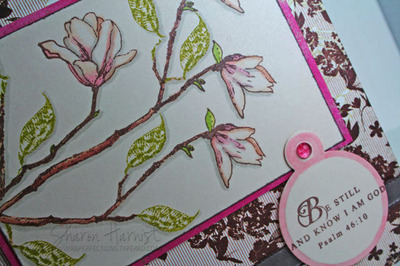 The tag is also a Spellbinder die (S3-028 Standard Tags) and was cut from a darker solid pink Two Scoops pattern. 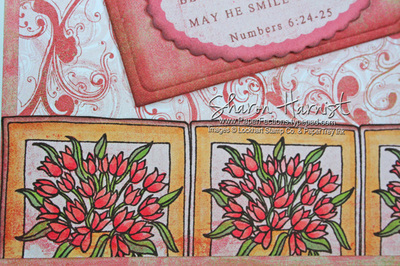 The corner die cut is Spellbinders S3-107 Decorative Photo Corners. Sheer pink ribbon is Making Memories. 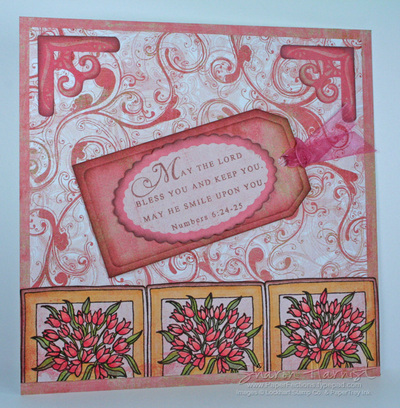 You can see everyone's Divine Design creations by visiting this SplitocastStampers gallery. If you join in on this challenge, be sure to let me know in the comment section below, so I can check out your project! I'll be back tomorrow with an announcement and a new project to share, so check back in! Warning . . . I'm going to get a little sappy on you today but there's artwork involved, so stick with me! One of my mottos in life has always been a famous line from one of my favorite movies . . . "Tomorrow is another day". I think what helps me shrug off the small stuff in life and think that tomorrow can only be better is knowing that I have faith in the Lord to take care of all my worries. One of those big worries in life happened in January with my blood clot and that really made me take another look at life. It made me think of all things I had wished I had done or that I'd always meant to get around to but hadn't . . . 10 days laying around in bed recuperating will do that for you, LOL! I also had a lot of down time to talk with friends and to reflect upon their impact on my life. Some of those sweet friends started a monthly venture this January to try and spread the Word of God through their artwork. You can check out their first blog posts on this venture here: Lori, Jami, Taylor, Angel. Basically, they've committed to sharing a year-long ongoing project that they will add Bible scripture to each month. It's neat to see all the project ideas they've had, so check out those links above. This scripture (1Peter 5:7) from Papertey Ink's new set, Everyday Blessings, really spoke to me so that's what I used for this month, along with this beautiful cross from the set. The scripture reads: "Cast all your cares upon Him, for He cares for you". Another sweet friend, Jody Morrow, had just sent me a beautiful birthday card with some wonderful assorted colors of Swarovski crystals in it and it was still laying on my desk. Since the dark pink crystals matched the lines on this Creative Imaginations paper (Antique Cream), I used those to embellish the cross. The beautiful swirl is from The Rummage Bin collection, Beautiful, by Cornish Heritage Farms. More details: Black page base is Prismatic Black, Brilliance Graphite Black pigment ink, Tonic Edge Distresser, Dimensionals under Spellbinders Nestabilities Petite Classic Ovals, oval sticker frame under scripture is from the same Creative Imaginations paper pack, Stampin' Up black grosgrain ribbon, EK Success corner rounder, sewing machine & black thread. 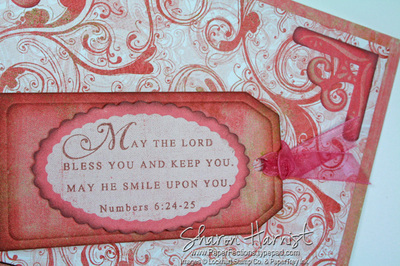 There's a large gallery at SplitcoastStampers.com of all the participants in this monthly challenge -- If you'd like to check out all the fabulous ideas, click HERE or use keywords: BVC08 (Bible Verse Challenge '08). Please feel free to join in this venture and post your creations on Splitcoast and if you do, please leave me a comment and link to your work so I can check it out! Have a happy weekend and I'll be back on Monday to share some new, fun projects with you!